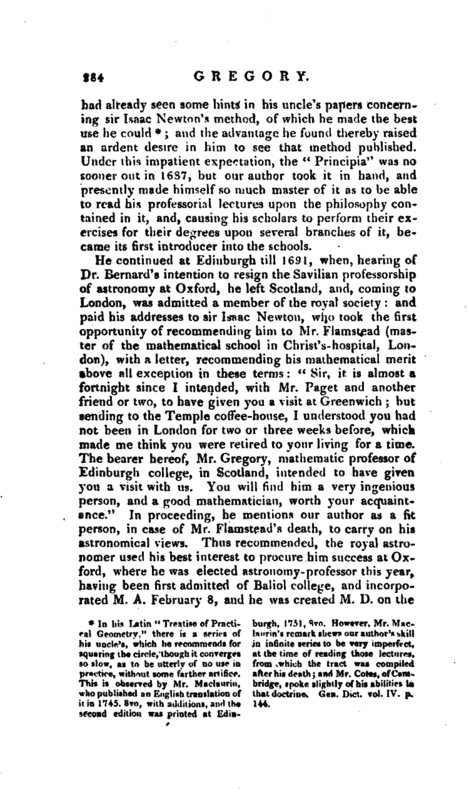 , son of the preceding, and nephew to the inventor of the reflecting telescope, was born June 21, 1661, at Aberdeen; where he also received the first grounds of his learning, but was afterwards removed to Edinburgh, and took his degree of M. A. in that university. 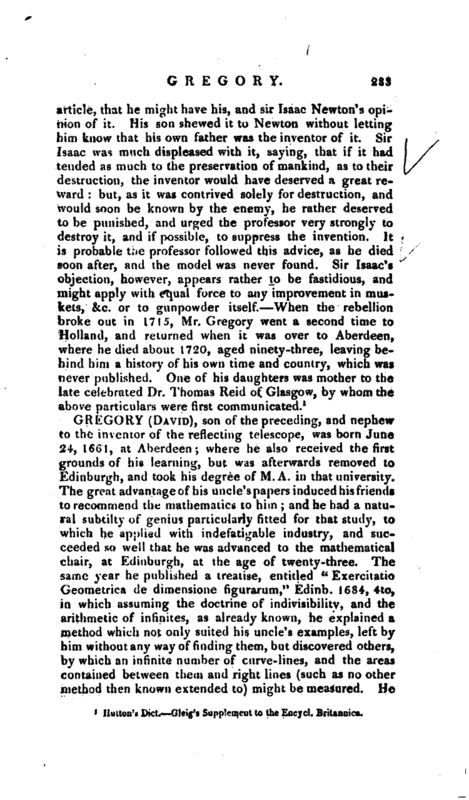 The great advantage of his uncle’s papers induced his friends to recommend the mathematics to him; and he had a natural subtilty of genius particularly fitted for that study, to which he applied with indefatigable industry, and succeeded so well that he was advanced to the mathematical chair, at Edinburgh, at the age of twenty-three. The same year he published a treatise, entitled “Exercitatio Geometrica de dimensione figurarum,” Edinb. 1684, 4to, in which assuming the doctrine of indivisibility, and the arithmetic of infinites, as already known, he explained a method which not only suited his uncle’s examples, left by him without any way of finding them, but discovered others, by which an infinite number of curve-lines, and the areas contained between them and right lines (such as no other method then known extended to) might be measured. He | already seen some bints in his uncle’s papers concerning sir Isaac Newton’s method, of which he made the best use he could *; and the advantage he found thereby raised an ardent desire in him to see that method published. Under this impatient expectation, the “Principia” was no sooner out in 1687, but our author took it in hand, and presently made himself so much master of it as to be able to read his professorial lectures upon the philosophy contained in it, and, causing his scholars to perform their exercises for their degrees upon several branches of it, became its first introducer into the schools. who published an English translation of that doctrine. Gen. Diet. vol. IV. p.
it in 1745. 8vo, with additions, and the 144. second edition was printed at | Edin18th of the same month, but he had no relish for the technical part of his profession, and was seldom seen in the ohservatory. His genius lay more to geometry, and in that way he succeeded very well, both in his elements of optics*, and of physical and geometrical astronomy. This last is reckoned his master-piece; and, having finished it in 1702, folio, he immediately engaged in carrying on the noble design of his predecessor, Dr. Bernard, to print all the works of the ancient mathematicians, the first-fruits of which appeared in an edition of Euclid’s works in Greek and Latin, folio, the following year. 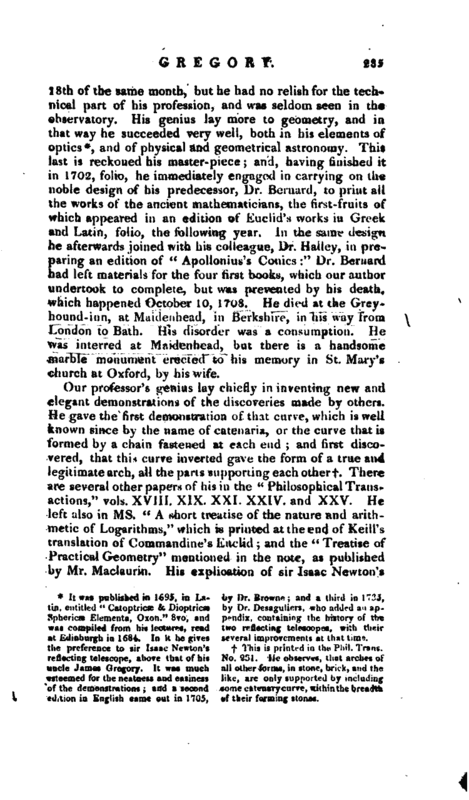 In the same design he afterwards joined with his colleague, Dr. Hailey, in preparing an edition of “Apollonius’s Conies:” Dr. Bernard had left materials for the four first books, which our author undertook to complete, but was prevented by his death, which happened October 10, 1708. He died at the Greyhound-inn, at Maidenhead, in Berkshire, in his way from London to Bath. His disorder was a consumption. He was interred at Maidenhead, but there is a handsome marble monument erected to his memory in St. Mary’s church at Oxford, by his wife. of the demonstrations; and a second some catenary curve, within the breadth edition in English came out in 1705, of their forming stones. | method, to construct the orbit of a comet by three accurate observations, is commended by Dr. Halley. Our author was a most intimate and confidential friend of sir Isaac, and was intrusted with a manuscript copy of the “Principia,” for the purpose of making observations on it. Of these Newton availed himself in the second edition, they having come too late for his first publication, which was exceedingly hurried by Dr. Halley, lest Newton’s backwardness might not let it appear at all. 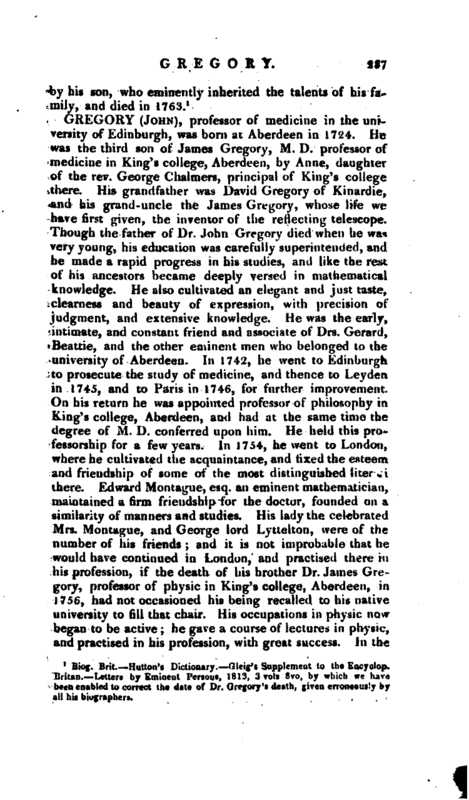 There is a complete copy of these observations preserved in the library of the university of Edinburgh, presented to it by Dr. James Gregory, the present professor of the practice of medicine. These contain many sublime mathematical discussions, many valuable commentaries on the “Principia,” and many interesting anecdotes. There are in it some paragraphs in the hand-writing of Huygens relative to his theory of light. 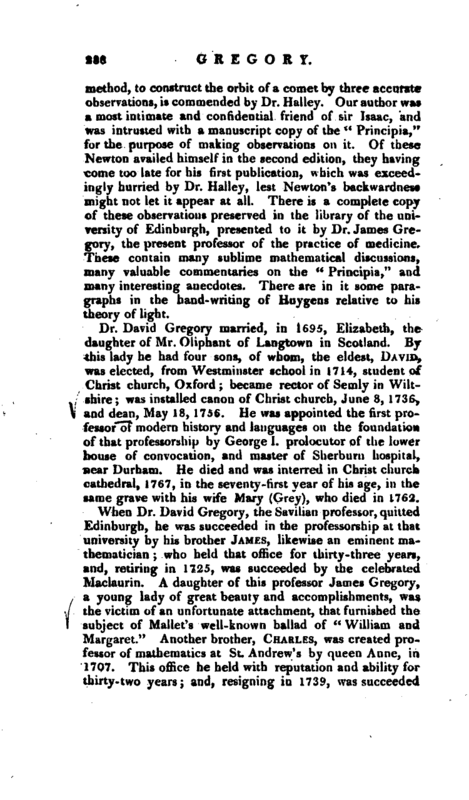 Dr. David Gregory married, in 1695, Elizabeth, the daughter of Mr. Oiiphant of Langtown in Scotland. By this lady he had four sons, of whom, the eldest, David, was elected, from Westminster school in 1714, student of Christ church, Oxford; became rector of Semly in Wiltshire; was installed canon of Christ church, June 8, 1736, and dean, May 18, 1756. He was appointed the first professor of modern history and languages on the foundation of that professorship by George 1. prolocutor of the lower house of convocation, and master of Sherburn hospital, near Durham. He died and was interred in Christ church cathedral, 1767, in the seventy -first year of his age, in the same grave with his wife Mary (Grey), who died in 1762. Biog. Brit. —Hutton’s Dictionary. Gleig’s Supplement to the Encyclop. Brit an. Letters by Eminent Perseus, 1813, 3 vols 8vo, by which we have been enabled to correct the date of Dr. Gregory’s death, given erroneously byall his biographers.